The “write” trends in stationery—we count down ten. Especially in an increasingly digitized world, paper has the power to endure. 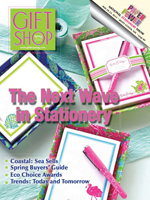 Even as the perennial giants in this category—greeting cards, journals, notepads and more—continue to reinvent themselves, they do so keeping an eye on trends sweeping all categories of the gift industry. Here’s a quick rundown of ten such trends worth keeping an eye on. Brights and fluorescents “toss back to the 60′s and 80′s, with hot pinks, lime greens, oranges, blues and yellows in demand in stationery,” says Mary Phillips, CEO of Mary Phillips Design. Look for these same colors in fashion this year.